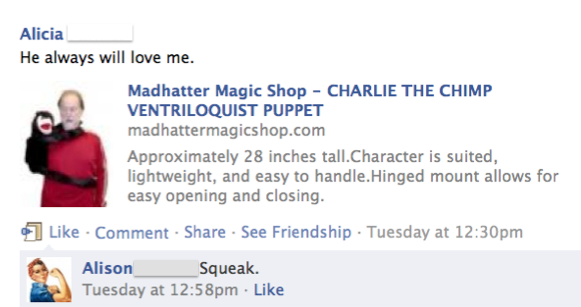 With Halloween approaching, my sister and I were recently chatting on Facebook about costumes. She was planning to go as Frida Kahlo, the Mexican painter. Me: That’s a bit obscure. How would people know? Alicia: Long wig. Flowy Mexican dress. Uni-brow. Mustache. Monkey. Fortunately, she lives in Ann Arbor, so most of her (well-educated and artistic) friends would be able to put that together. If I tried to pull that off in DC, where things run a bit more political and less cerebral, I think people would just think I was aiming going as a transvestite with a monkey fetish. A few days later, I chatted her again. Me: How is the costume progressing? Alicia: It’s not. Too expensive. I’m at $35 already and I don’t even have the wig or the monkey. Pulling the plug. Besides, I don’t know where I would get a monkey. Me: What about that monkey you had when we were kids? Me: The puppet. Where you velcroed its arms around your neck and stuck your hand up it? Alicia: I had this monkey? Me: Yes. It had a squeaker in its mouth you could squeeze. Alicia: Sounds like you were jealous of my monkey. You remember it a little too well. Me: I was. You wouldn’t let me play with it. Alicia: Had I known, I would’ve worn it around constantly. In case you’re curious, her latest costume idea is even better than Frida and would play well anywhere. Any guesses? That’s right – she’s going as a bad ventriloquist. We’ve already decided that has the potential for sheer comedy after a few glasses of wine. The best part? She’s been practicing saying, “Who’s your daddy?” through gritted teeth all week, which – even without the puppet – is pretty awesome. ← Revenge is best served in clogs. I love your humor! As a child my sister was always crying her heart out because she wished to have a living monkey. Gosh – I was thankful that she didn’t succeed! Actully, didn’t mean to reply to Shivani, but have a stand alone comment… but you get me. Something to be said for a man dressed as Frida. Please send pics. This is the first year I have decided to forgo all Halloween shenanigans. Except for the pumpkin patch. And carving a pumpkin. And handing out candy. Yup, just giving up on the whole thing. I can’t wait! Is it too late to start dieting for a costume involving a skintight catsuit? Well look who’s been FP’d! Congrats! As to Frida and the monkey, honestly, if I saw that I would likely think it had more to do with that animal breakout in Ohio. 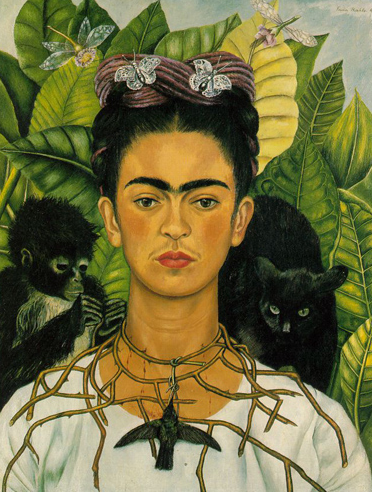 I would also assume the monkey had herpes, which had somehow caused Frida’s unibrow. Or perhaps I would think the unibrow and long hair, paired with the monkey, implied something about evolution. I am fairly sure no one in Michigan would think these things. Your sister to sister relationship mirrors mine with my sister. Some of her funniest Facebook posts are the ones that make absolutely no sense whatsoever to anyone else in the entire world but leave me rolling on the floor in laughter, trying not to pee. Great post! Don’t be too jealous…I had a monkey like that when I was a kid too…and also had a younger sibling to taunt with it. Thanks! Feels like I won the jackpot! I love both costume ideas! It sounds like you and your sister both inherited the humor gene! The difference? Her sense of humor is more twisted than mine. Now she’s talking about being the ventriloquist’s dummy for Halloween. Love it! Actually I love both of them, your sister has killer ideas.